Many are aware of the recent eruption of the Kilauea Volcano on the island of Hawai’i. 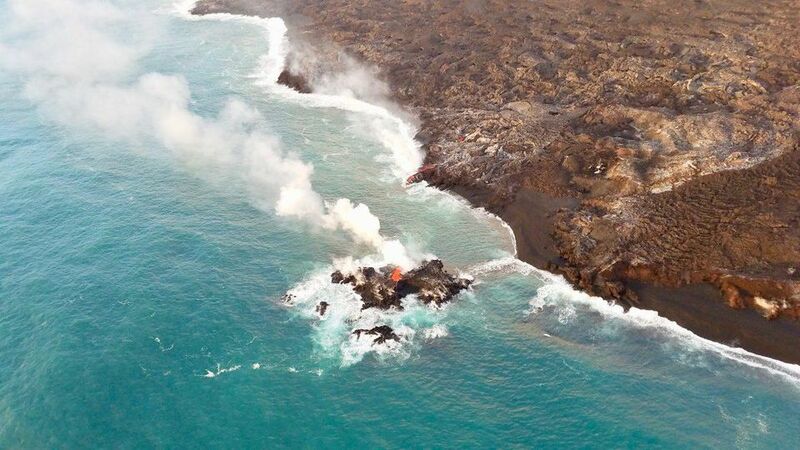 The lava flows this eruption has produced have entered the ocean at several locations, expanding the island’s shoreline and even creating a small new island offshore. As an individual who has spent many a working hour assessing how shorelines (or normal baselines, as they are referred to under the Law of the Sea) will impact territorial sovereignty and boundaries with neighboring countries, I thought it would be an interesting exercise to assess how this latest eruption could affect the sovereign limits of Hawaii and the United States. The island of Hawaii, showing locations of the volcano summit and Active Fissure 8, the origin of recent lava flows. To begin this exercise, I pulled an island polygon for Hawai’i from an early June edition of OpenStreetMap — prior to the eruption. I then pulled the same feature from the latest OpenStreetMap. It speaks volumes to the power of OpenStreetMap and dedication of its contributors that the lava flow areas and expanded shoreline have been added and updated since the eruption in early July. Active lava flows and ocean entry, showing area of expanded shoreline since the eruption. An area measurement of the land added since the eruption yields about three sq. km. (shown in dark red on the map above). To assess the impact of the expanded shoreline on the 12 nautical mile territorial sea, I ran two simple “envelope of arcs” calculations in CARIS software (their Limits and Boundaries module). For one calculation I used a pre-eruption normal baseline, and for the other a post-eruption normal baseline. With each calculation, I was able to identify the contributing base points along the normal baseline as well as construction lines emanating from each to create the 12 nautical mile territorial sea limit. 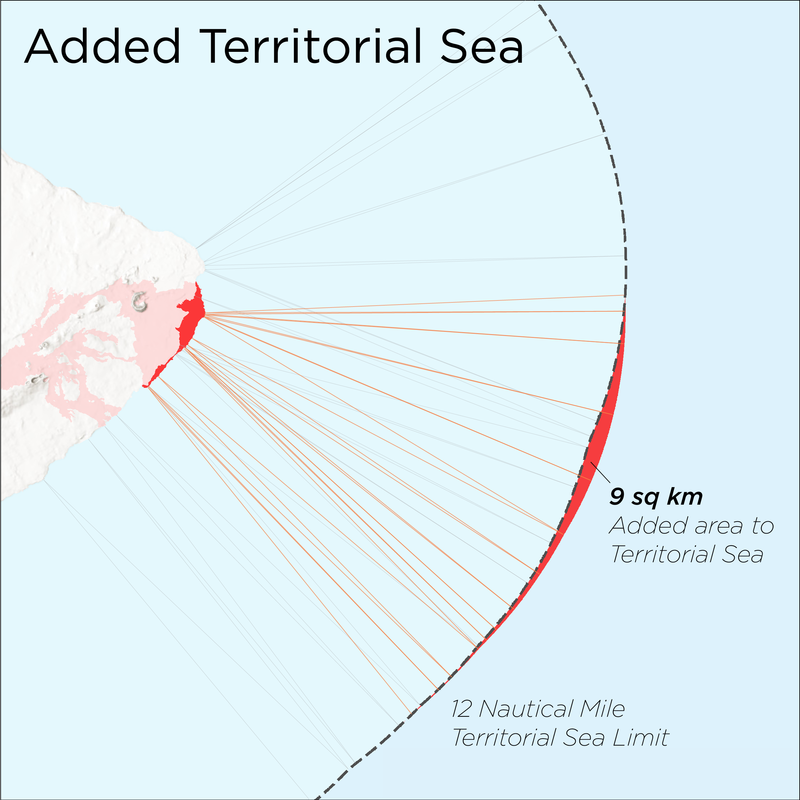 Calculation of 12 nautical mile territorial seas showing contributing base points along the new and older shoreline, construction lines, and the territorial sea limit. 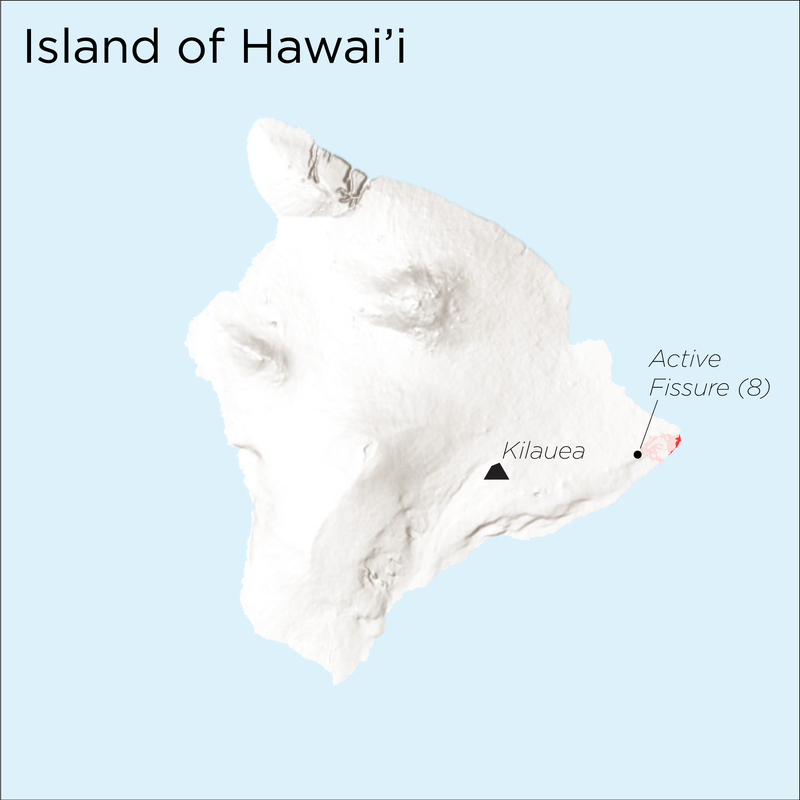 In this real-world example, the expanded shoreline of the island adds about nine square kilometers to the territorial sea area of the island of Hawai’i. So does this mean there is a direct correlation between newly formed land and area added to a country’s sovereign space? Not really. In the case illustrated above, the expanded shoreline has been built out seaward enough on a slightly convex coast that it adds new contributing base points to the 12 nautical mile territorial sea. 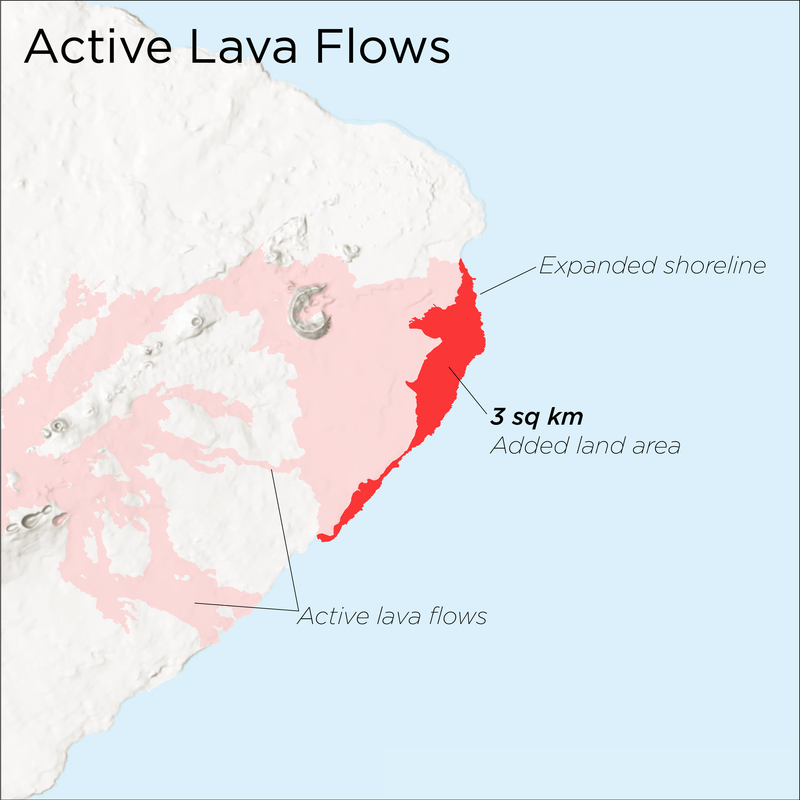 However, if the lava were entering the ocean in an area of coastal concavity, bay, or inlet, we might see several square kilometers of new land that does nothing to change the outer limit of the territorial sea. Diagram illustrating lava filling in a coastal concavity, versus lava expanding on an area of coastal convexity. 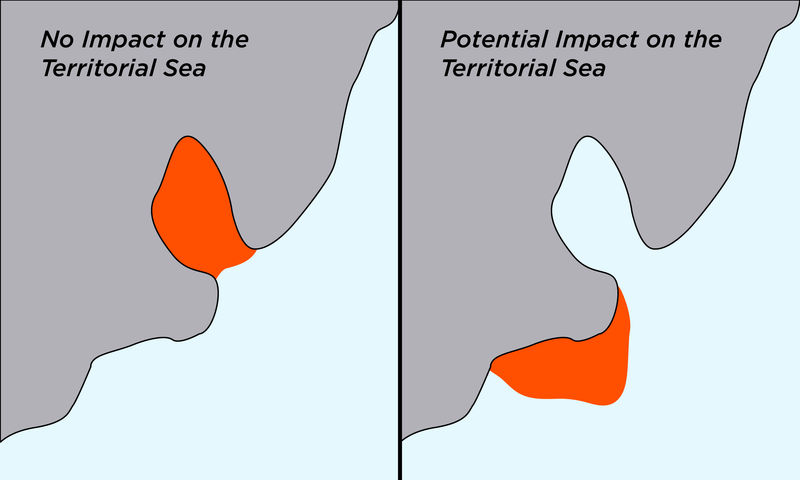 The latter might contribute to an expanded territorial sea. Of course, this new “land” created by the eruption is quite fragile and susceptible to collapse and rapid breakdown, so just as quickly as we’ve added 9 square kilometers to the United States’ sovereignty, it could get washed away.